Driving through the capital city of Hungary we leave for wonderful landscape, for traditional buildings and for history to visit the Danube Bend. On the northern part of the country for a few kilometres the river Danube is the natural border between Hungary and Slovakia. During this tour in Hungary the first stop is in the city of archbishops, in Esztergom, which is just situated on the border. It is a really historical town. The first king in Hungary - St. Stephan – was born here and crowned in 1000. The very first roman-catholic church was built here as well. During the centuries ruined but rebuilt - today you can visit the largest roman-catholic church of Hungary, the Basilica of Esztergom. The next town to visit is Visegrad. The castle from the 13th century is on the very top of the hill and from there one can get a nice view to the whole bend. This bend is the largest turn all along the river Danube. It is like a big „S”. It is really worth to see! For lunch we take the guests to a local restaurant. Thy get a three-course menu made of typical Hungarian dishes. The last stop is at the friendly artists’ town, at Szentendre. Just like in the Mediterranean countries, the village is on a hill and all the streets run down to the water. 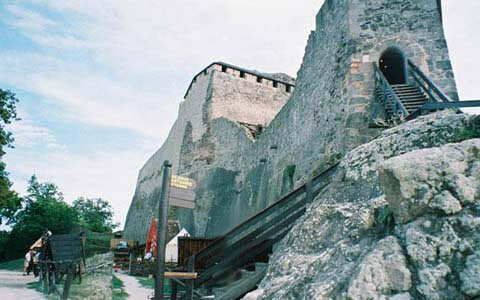 Here we can have a walk along the narrow streets or along the Danube on the promenade. One can enjoy the romantic feeling among the 18th century baroque houses. We show our guests the town – they can walk along the main street to the centre of the old town. On the main square there are the holy trinity monument and the oldest Serbian orthodox church in Hungary. Along the narrowest street they can reach the top of a small hill and have a look at the area.